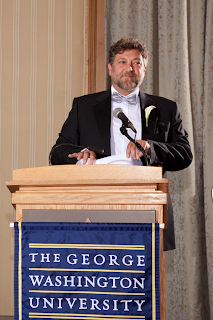 Neemat Frem, President of the Association of Lebanese Industrialists and INDEVCO Group CEO & President, addresses attendees of George Washington University 2012 graduation dinner on 29 June. George Washington University hosted Neemat Frem at the graduation ceremony of the specialized "Master of Science in Finance Program”, ranked second world-wide by the Financial Times. Frem discussed the importance of servant leadership and modesty as crucial values ​​necessary for the success of leaders in global economy and politics during the graduation dinner at the Four Seasons Hotel in Washington D.C. He implored graduates to become leaders and explained how truly successful leaders serve others, as well as adhere to a high set of morals and strong internal value-system. Frem’s speech aroused much applause from the audience. 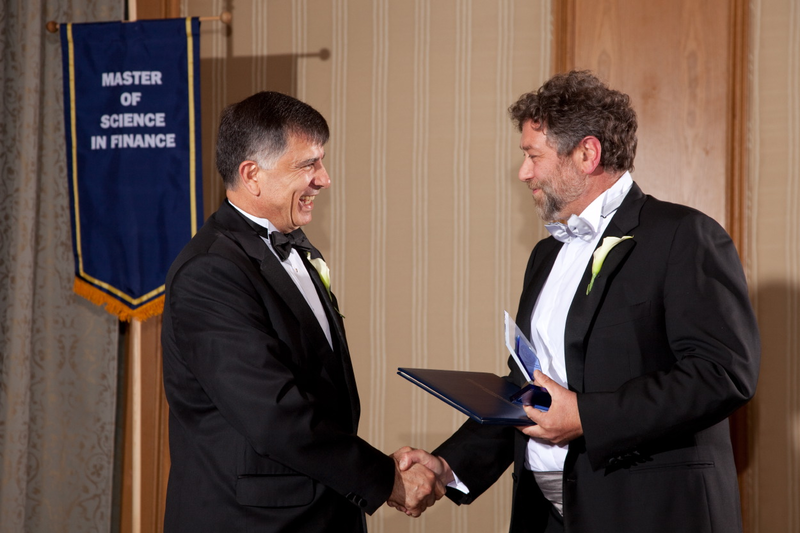 Professor George Jabbour, Director of the Specialized Program, presented Frem with the Honor Shield and a certificate of appreciation, on behalf of George Washington University. The dinner brought together graduates from diverse backgrounds and nationalities along with their families, as well as senior representatives at the World Bank, officials of donation funds, and US development bank employees. “Thank you, Dr. Jabbour, Dean Guthrie, distinguished faculty and staff. Family members. And Graduates! As we say in Lebanese, Alf Mabrouk! One thousand congratulations to each of you. It’s a pleasure to be with you this evening. I don’t have any advanced theories, best practices or case studies to share with you tonight. Thankfully. Right?! But I’m not here to sing for you either; I do have some heavy points. In fact, sometimes lessons have nothing to do with what we’ve studied. So I’d like to focus on two simple ideas I think are essential to the success of economic models as much as political systems. And you can add personal ambition as well. No doubt most of you here will experience success, wealth and maybe fame. You will be asked to lead. You will be leaders. Leaders are those fishermen that stop fishing fish one day, and start fishing men and women, inspiring them, driving them, but above all serving them. So, the first idea I want you to leave with you tonight is the concept of Servant Leadership. Whatever you do in your high profile positions, remember that all the mistakes and horrific things perpetrated by leaders happened when they forgot that their duty is to be at the service of their mission, whether be it their people, their company, their market or their nation. They reverse the normal order of things. Their duty is to be at the service of their mission. They put their mission at their service! When I think of a servant leader I cannot but think of my father. Georges Frem dreamt of and built a multinational manufacturing group from Lebanon, a small country about the size of Rhode Island. His personal philosophy became our corporate mission: “What is good for the community is good for the company.” So we grew both vertically and horizontally, based on actual needs – sometimes very basic needs – of the communities around us. Today, this mission binds over many nationalities and languages across our 60 companies worldwide. We have a team responsible for cascading this mission and our values throughout the organization. My father always believed that in the absence of self-administered values, no law or regulatory body or even sanction can protect a system from the vice of human weakness. In fact, just think of Communism. That was supposed to be a virtuous idea of sharing; it ended up being the instrument of so much horror and deprivation. Look at Capitalism, this wonderful invention for unleashing the full potential of human capital. It also caused so much pain and desolation; from the gloomy days of the 1929 crash to the latest 2008 global financial crisis. From all this, we can definitely say, that breakdowns in economic systems are the result of greed and selfishness laid in the heart and souls of the trusted ones. The pinnacle of human weakness is in full display in the political world: especially in the Middle East. How many opportunities have we missed because of the lack of values in the hearts of our leaders? May the Arab Spring we’re observing today - with a mixture of hope and cautiousness - blossom a new breed of leaders who understand the splendor of being servant leaders! The second idea I’d like to share with you tonight is Modesty. Now we all believe in the drive for success. You would not be here celebrating if you didn’t! There’s nothing more invigorating than the adrenaline rush of challenge or the power you feel in achieving what you dreamed. However, sometimes it can “go to your head”. The dizziness of glory! This is one of the diseases that make you destroy the ladder you are climbing on and you collapse without noticing. It destroys your immune system against all sorts of irrational judgments. [PAUSE] Disproportionate actions and foolish challenges. It makes you flash instead of glow. George Washington, after whom your great university is named, could have become a king. But it was his choice of duty and honor as a modest citizen, which propelled him to the rank of a “Founding Father”. What a sensible trade-off. A flash of a decade for an eternal glow. If you want to build a better world, if you want to glow permanently, tame yourself first, be in control. Adam Smith in “The Theory of Moral Sentiments”. What does he say about Self-Command, his cardinal virtue? That we have the ability to rein in our impulses and to regulate our behavior. That we can restrain the passion for our own self-interest. In fact, history tells us that it is not always the strongest or the smartest, but men and women of character who are the most successful leaders. If you think of respected leaders – the people you equate with greatness – you’ll find that they have been able to balance competing desires. In closing, when you think back to this dinner I hope you will completely forget the bugger that kept you waiting to eat this long, but please remember these two values: Servant Leadership and Modesty. In being both, you remain teachable. You remain students forever – for your sake, and for the good of your company, your community, your nation. Labels: Association of Lebanese Industrialists, INDEVCO Group, Neemat Frem, university relations, USA, Washington D.C.